For the past few weeks, I've been driving around Atlanta, attending events, working at my church, and going to my regular gym classes with an extra sense of wonder. Each place I go, I'm struck by the fact that I am known here. I can randomly run into someone at the store and the man who works the front desk at the YMCA on Monday nights remembers my name. These things may not seem like a big deal, but they are to me because a year ago, I still felt alone in this big city. Last year around this time I was grateful for the community I had found at Columbia. I certainly didn't take it for granted, but it wasn't easy. I still didn't quite feel known, but that wasn't what was hardest. It was hardest to feel unknown, and unknowing, of this city I had decided to call home for the next three years. I was attending a different church each week, shaking hands at the passing of the peace and slipping out when the service was over. I was still figuring out exercise, grocery shopping, and recreational habits. I was struggling to find a job and feeling the stress of months without a paycheck and bored without having meaningful work. Everywhere I went outside of Columbia Seminary, I was utterly unknown. Yet, as I look around today, I am in awe of how different my life is than it was a year ago. I'm not sure I love Georgia for its own sake quite yet, but I have certainly come to love my life here. I love my routines- from the 6 am gym classes to the quickest route through the farmers market and a favorite local wine store with free tastings on Wednesdays. I have my favorite morning walking path, Monday night dinners with friends, and work that excites me. I'm even filled with gratitude for the climate that felt so foreign to me last year. This year, I'm loving the crisp Autumn morning and then even more grateful for the warm and sunny afternoons. It's the little things that make up a life. Life is so different than it was a year ago, even if on the outside it looks mostly the same. I'm not who I was a year ago, thanks to a tumultuous summer and a great counselor. (Side note- counseling is awesome and I 100% would recommend it to everyone. I've come to see therapy as clearing muddy waters or muddying waters that are deceptively clear. Mine has been mostly the latter and it has been invaluable to me). I've been learning about myself- my strengths and my many flaws. 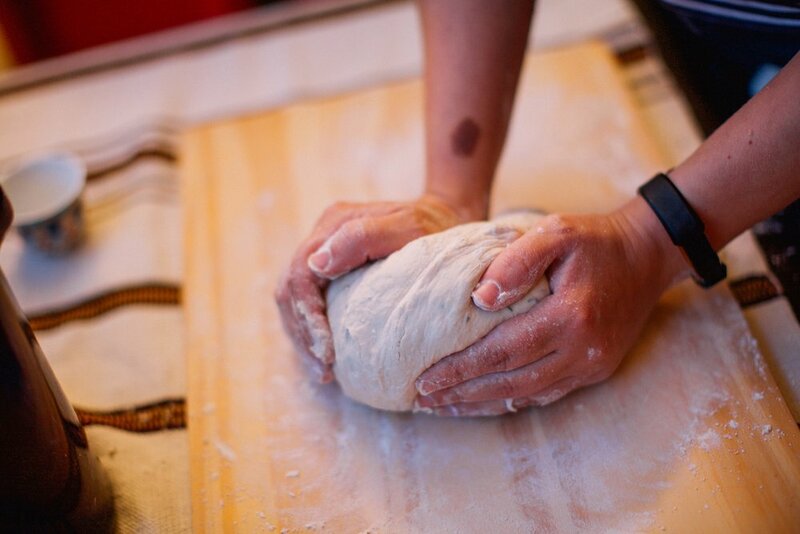 Each time I try to describe, even just to myself, I keep going back to the image of kneading dough. I love to make dough that requires rising and kneading. It's a time-consuming process that requires you to get your hands messy. You push the dough over and over with the palms of your hands, keeping together with your fingers and pushing it back on top of itself. You add flour when it gets sticky and as you work the dough, it slowly forms a ball. I have felt like this piece of dough this year, being slowly pushed by God's hands, over and over on top of myself. It's been gentle, but forceful. Sometimes I think I'm being taught the same lesson over and over again, but I guess that's what it takes. It's been painful, but tender at the same time. I feel like I'm in the process of becoming something new. I'm already something (and someone) but I'm on the road to something more. This kneading process has left me tender and vulnerable in ways I had tried to avoid. It's left me tender ways that can leave me with a bruised ego, or worse yet, a broken heart. But I think I need a broken heart to survive in this world because the alternative is a heart so well guarded and safe that it is incapable of love or being loved. So I'm being kneaded over and over, always in the gentle hands of my Creator. I'm almost halfway through my time in Atlanta and there's a part of me that's getting restless again. But that's not what this is about. This is about gratitude for the slow and subtle changes that time brings, like yeast working its way through the day. As the leaves are falling and Christmas music is finally playing, my heart is full of gratitude. Life was hard a year ago and it's hard today in ways I wouldn't have imagined them. But it is something new. It is still becoming something new. And for that I say, Thanks be to God.